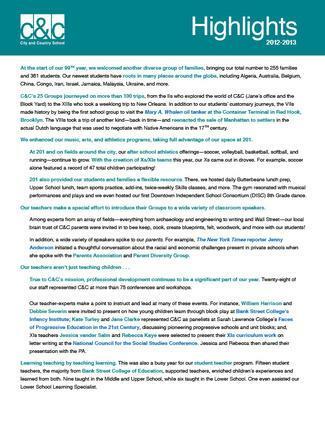 Welcome to our annual edition of Highlights—a sampling of milestones, events, and news that occurred at C&C over the past twelve months. We invite you to reflect with us on our many accomplishments and activities. City and Country’s 2012-2013 school year was notable for the weather (Hurricane Sandy), our constant movement (full schedule at 201), change, adjustment, mobile technology, and children’s growth and learning. As always, it was hard to fit such a full year on two pages. Best wishes for your continued summer renewal.